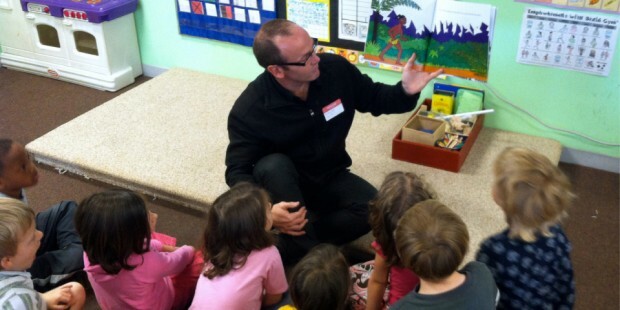 Fraser Hill, principal of Swannanoa School in Rangiora, reads to American children during his Fulbright exchange to the US in 2013. New Fulbright Distinguished Awards in Teaching increase the number of exchange opportunities available to teachers. Fulbright New Zealand is excited to introduce a new two-way awards programme for the exchange of teachers between New Zealand and the United States of America. In December 2013, New Zealand was one of 12 countries (including the US) to offer awards under the Fulbright Distinguished Awards in Teaching Programme. Awards are available for New Zealand and American primary or secondary school teachers to participate in an intensive professional development programme in each other’s countries. Under the new programme, two New Zealand teachers (or library media specialists, guidance counsellors, Special Education coordinators and administrators who teach students at least 50% of their time) will join international counterparts from countries including the UK, Israel, India, Mexico and South Korea on a four-month professional development programme hosted by a single US university’s college of education. They will enrol in advanced undergraduate or graduate level classes; design and complete a capstone research project; observe, team teach and/or conduct seminars or workshops in local schools; and engage in other teaching-related activities. Grantees will also participate in a web-based collaborative project with other participants to share best practices and other elements of their countries’ educational systems. This new opportunity is funded primarily by the US Department of State as part of the international Fulbright programme, but has been made possible thanks to additional support from the New Zealand Ministry of Education which is funding administration costs on the New Zealand end. The Fulbright Distinguished Awards in Teaching Programme for New Zealand Teachers builds upon existing education awards for New Zealand teachers to undertake short-term professional development (Fulbright-Meg Everton Professional Enhancement Awards in Education) and longer research exchanges to the US (Fulbright-Cognition Scholar Awards in Education Research). Under the reciprocal Fulbright Distinguished Awards in Teaching Programme for US Teachers, American teachers will undergo a similar exchange to New Zealand, although they will do so as individuals rather than part of a larger group. Fulbright New Zealand’s executive director, Mele Wendt, says the Fulbright programme has a rich history of teacher exchanges, which have been a part of the programme since it first began over 60 years ago. The availability of these new awards is especially timely with formal professional development opportunities for teachers on the decline and greater cooperation between our countries. US Secretary of Education Arne Duncan will visit New Zealand in March for the fourth International Summit on the Teaching Profession, being held in Wellington.